Jesus' body was hastily placed in a tomb on Friday afternoon. There was no time to properly prepare the body for burial with spices and ointments according to Jewish customs. No work could be done on the Sabbath, so that task had to wait until Sunday. Early Sunday morning, Mary Magdalene and several other women went to the tomb with the spices they had prepared. When they arrived, they found the tomb had been opened already. When they went in, they did not find Jesus' body, and they wondered what had happened. Suddenly, two angels in dazzling white clothes were there. The women were terrified, but the angels said to them, "Why do you look for the living among the dead? He is not here; He has risen! The women ran back to tell Jesus' apostles what they had seen. Peter and one other apostle went to the tomb to see for themselves. They looked in and saw the linen cloths that Jesus' body had been wrapped in but nothing else. Then they went home, amazed and confused. Mary Magdalene stayed outside the tomb crying. Suddenly she saw Jesus standing there, but she did not recognize Him at first. Jesus said to her, "Woman, why are you crying? Who are you looking for?" 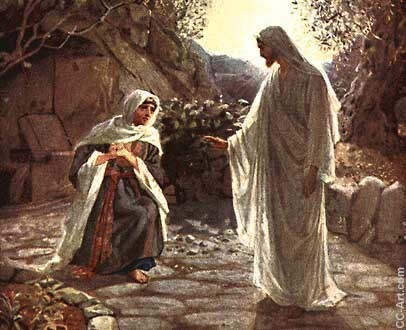 Mary thought He must be the gardener and said, "Sir, if you have taken Him away, tell me where, and I will take Him!" Jesus said, "Mary!" Then she recognized Him and exclaimed, "Rabboni!" Jesus said, "Touch me not, because I have not yet returned to the Father. 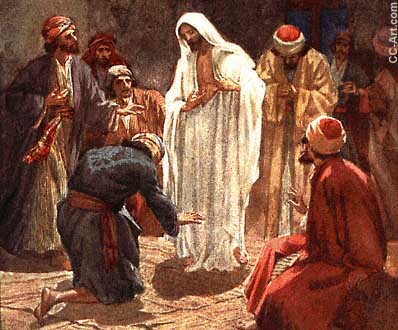 But go to my disciples and tell them, 'I am ascending to my Father and your Father, to my God and your God.'" Then Mary Magdalene went and said to the disciples, "I have seen the Lord! ", and she told them everything that had happened. Later that same Sunday, two of Jesus' disciples, Cleopas [KLEE uh pas] and another man, were walking along the road to a village called Emmaus [em MAY us], which was about seven miles (11 km) from Jerusalem. All day they had been talking and wondering about all the things that had happened. 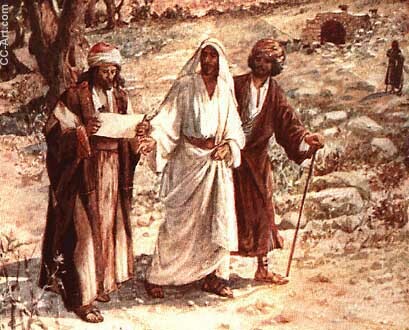 Jesus talks with two disciples on the road to Emmaus. Suddenly, Jesus was there with them, but they did not recognize Him. "What are you talking about as you walk along?" He asked. The two disciples looked sad. Cleopas asked, "Are you the only one in Jerusalem who doesn't know the things that have happened there in the last few days?" "What things?" Jesus asked. "The things about Jesus of Nazareth, who was a great prophet before God and all the people, and how our chief priests and leaders handed Him over to be crucified. We had hoped that He was the one to redeem Israel. Yes, and besides, it is now the third day since all of this happened. And now, some women of our group amazed us. They went to His tomb early this morning, but they did not find His body there. They came back and told us that they had seen angels there who said He was alive. Some of those who were with us went to the tomb and found it just as the women said, but they did not see Jesus." Then Jesus said to them, "Oh you are so foolish, and slow of heart to believe in all that the prophets have spoken! Wasn't it necessary for Christ to suffer those things and enter into His glory?" As they came near the village of Emmaus, the two disciples said to Jesus, "Stay with us, because it is late and the day is now nearly over." So Jesus went in to stay with them. As they were eating, Jesus took bread, blessed it and broke it, and gave it to them. Suddenly they recognized Him as Jesus, and He vanished from their sight. The two disciples quickly returned to Jerusalem and found the eleven apostles and some of Jesus' other followers gathered together. The apostles told them, "It's true! The Lord has risen and has appeared to Peter." Then the two disciples told everything that had happened on the road to Emmaus. "Doubting Thomas" becomes a believer. That same Sunday evening most of the apostles were together. They had locked themselves in a room in fear that the religious leaders would want them crucified next. Suddenly, Jesus was there among them. He said, "Peace be with you." Jesus showed them the wounds from crucifixion in his side and hands. The apostles were overjoyed to see Jesus alive again. Jesus said again, "Peace be with you. As the Father has sent me, so I send you." The apostle Thomas was not with the others when Jesus appeared to them. So the others told him, "We have seen the Lord." But Thomas said, "Unless I see the nail marks in His hands, and put my finger in the nail holes and my hand in the wound in His side, I will not believe it." A week later the apostles were again locked in the same room, and Thomas was with them. Jesus again came and stood among them and said, "Peace be with you." Then Jesus said to Thomas, "Put your finger here and look at my hands. Put your hand in my side. Don't doubt it any more. Believe!" All Thomas could say was, "My Lord and my God!" Jesus said to him, "Have you believed because you have seen? Blessed are those who have not seen but have come to believe."